Two new patents from Microsoft have emerged. The patents concern wearable technology, specifically for health and fitness features. Microsoft had a hard time with the two previous wearables developed for consumers. The Band 1 and 2 suffered from defects and a lack of popularity. The bands regularly split and there were issues with the battery. There were also complaints about the aesthetics of the Band. However, the Microsoft Band had some things going for it. The software was decent and it was hard to beat the huge array of sensors packed into the wearable. The first patent is for a metal ring sensor that makes direct contact with the skin. Its purpose appears to be measuring stress levels via electrical conductivity. There are two of these sensors, the purpose of which is to maintain constant contact with the wearer's skin. This would be difficult to accomplish with just one sensor since movement and the size of a person's wrist play a large part in a good fit. It should be noted that this patent was a continuation of one filed in 2014. The image for these sensors shows the two rings on the battery portion of what looks like a Microsoft Band. 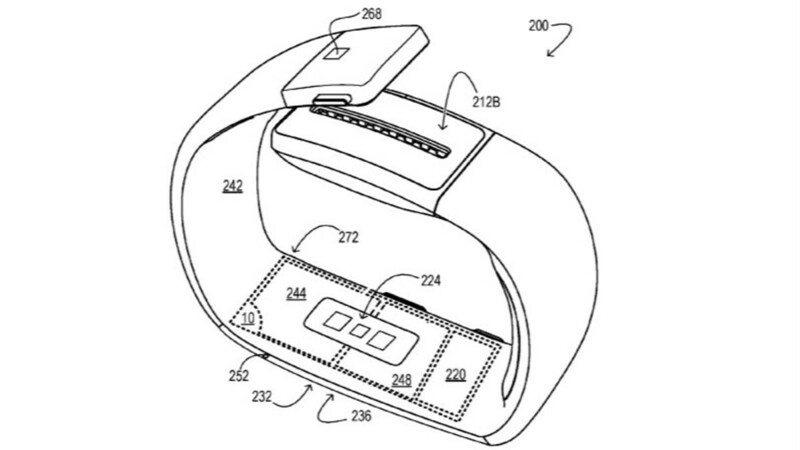 The Band already had similar sensors here so it is likely this patent just contains updates to an existing technology. The second patent shows technology that we know is being worked on by other companies as well. It is designed to estimate blood pressure. This is likely done with a combination of sensors and AI. The image in the patent highlights the area where the heart rate and pulse-oximeter technology were already housed. We have seen this same concept for estimating blood pressure with a combination of the Galaxy S9 sensor and an app. It is no surprise that if other companies want to stay relevant in the fitness market, blood pressure monitoring is the next likely step. Does this mean we will see a new Microsoft wearable? Well, not necessarily. Companies regularly submit patents for tech that never emerges on the market. Microsoft did start working on a third iteration of the Band, which was later scrapped. We know the company even had working models since execs were spotted wearing them. There is another possibility as well. Since the Band 3 was abandoned, Microsoft has still had involvement with wearables. These devices were not intended for regular consumers, but for industrial and healthcare purposes instead. Both scenarios could be likely outcomes for the new technology. Microsoft could be developing a new wearable alongside Andromeda, or it could simply be working on something more specialized like a wearable for patients in a healthcare facility. Perhaps more will be revealed as information is released throughout 2018. Microsoft band was one of the best wearables at that time, and with these improvements, I bet it'll be a success. As a fitness tracker, it's still the best. Were it not for the blasted straps splitting, I'd still be using it.